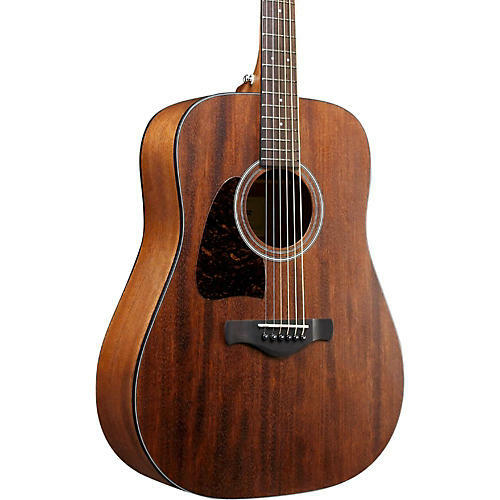 Open-pore finish lets you enjoy the natural beauty of this all-mahogany dreadnought. Now left-handers can also enjoy the embodiment of what might be called the Ibanez "modern approach to tradition." Cutting-edge woodworking technology enables the guitar maker’s luthiers to reproduce the sophisticated bracing techniques of one-of-a-kind instruments of yesteryear. The dreadnought body shape of the AW54LOPN, and solid mahogany top offers full-bodied, well-rounded bigger-than-expected sonic response. The guitar’s solid mahogany top along with its mahogany back, and sides, breathe freely thanks to a special open pore finish treatment, giving it a full, rich, open sound. A simple, clean, black-and-white multi rosette handsomely appoints an understated flat finished top. Ibanez chrome die-cast tuners ensure smooth, accurate, stable tuning.